Thanks to the lovely ladies over at Coolspotters, we now know what pea coat Alice is wearing in Eclipse while she and Emmett are lurking protectively outside of Bella’s house. Don’t ask me how this was spotted, because I honestly have no idea — someone obviously has some very sharp eyes. At any rate, here’s what we know: it’s called a HURLEY Winchester YC Jacket, and it comes in several different colours — white and green, for instance, as sold on Zappos, and blue and yellow, as sold on eBay. Alice’s, as you can see, is black. I wouldn’t buy this for costuming purposes — it’s not very distinct as an Alice outfit — but I love this coat. What do you think, ladies? I love it! you do make a great point though, it isn’t very distinct when it comes to Alice. – but it’s still and awesome coat! Ummm, yeah. Whoever spotted that is AH-mazing! It is a very cute coat. Considering I already have to many jackets though it probably isn’t one I’ll be getting soon. It’s a very cute coat. I love the cut of it. Good eye to whoever spotted it. I JUST this minute finished watching Eclipse! I was totally trying to figure out if she was wearing the same black jacket as in the training scenes…I came to the conclusion that No it indeed was not, but couldn’t get a clear look at it! Amazing spot! I agree that it is not distinctly Alice but adore this coat! Wow. Someone has good eyes!! Too bad the black ones are sold out. Those are quite nice and I’d totally buy one for myself. It’ll come in handy with the cold, but I’d want the black one. thanks ladies. that was me. hi! i’m stacy. i liked the idea of the challenge of finding the last alice item in eclipse that no one else had spotted, so i went through the coats and outerwear sections of brands that had already been used for alice and others that might make a coat that looked like this. i costume design in theatre, so i forced myself to draw out the coat myself on paper to get a thorough understanding of how the garment was put together…….i had worked in “vague” conceptions before this point, which got me close, but no cigar. 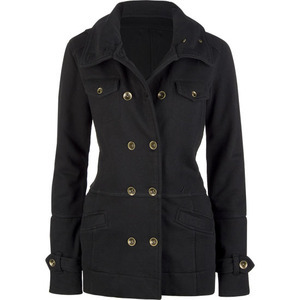 finally went back to coolspotters and searched for “hooded peacoat” and found the hurley jacket. all the details matched! glad i found it. i am a fan of the coat and it looks like others agree, so i’m glad i gould help! if you want to use your powers for more good, i’m DYING to find the dress she wore at the graduation party! into the babydoll dress. i’m thinking id get a size 12-14 just for the extra fabric, then turn the solid piece below the waist 90 degrees so that if you un-ruche it you’ve got the length you need. might need two shirts to be able to do this, though. time for an ebay search! Just found one on eBay in a Small, I snapped it up immediately because I haven’t seen the black ones anywhere. Its going from the UK and I paid less than 55USD for it NWT 😀 Does the happy dance!